I've put this on it's own page because of the number of emails I have received from people who have found fossilized shark cartilage, but have had a difficult time trying to id it. Fossilized shark cartilage has a distinctive pattern on one side, consisting of densely packed prismatic structures. 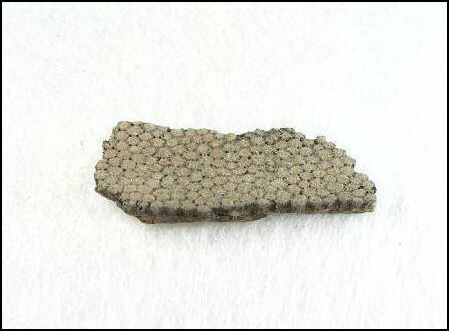 It is very fragile and is normally found only as small fragments. I've noticed that more of it seems to show up laying right on top of the gravel banks than any other place. This prismatic pattern is associated only with sharks. Due to their fragile nature any fragments found tend to be small.